So normally I don't see Jukebox Musicals. They just don't appeal to me. 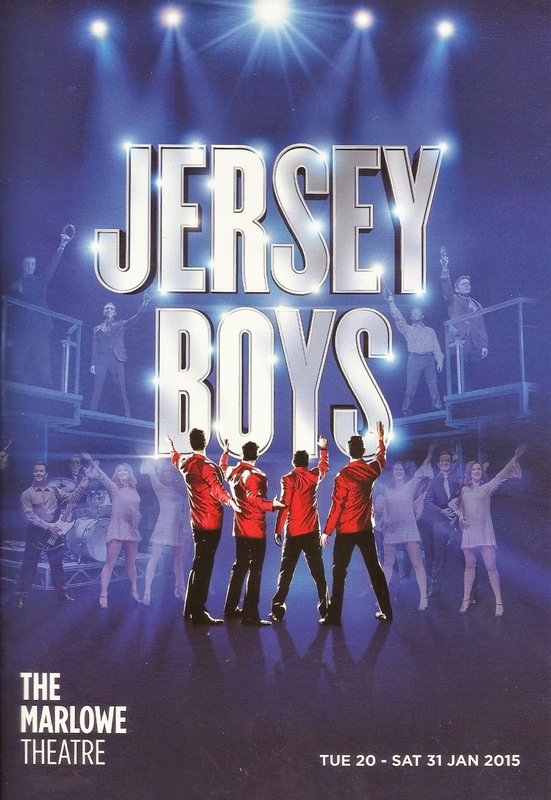 But when I heard that the Jersey Boys tour was going to be coming to the Marlowe Theatre, the nearest theatre to me, my interest was piqued. Although it only opened on the West End in 2008 (I say only, but it's still running now and that's one heck of a feat! ), it feels to me like it's been running forever, and for ages I'd been curious. What was the magic formula that was making this dramatisation of the formation, career and decline of The Four Seasons so successful? Well, as it turns out, the popularity comes from the fact that the songs are so familiar, so fun, and so easy to sing/clap along with. Even if you don't think you know any of The Four Seasons' music, I guarantee you, you do! In fact, perhaps the most memorable parts of the musical were set to the most popular songs. Beggin', Sherrie and Big Girls Don't Cry were all highlights that got the audience really excited, meanwhile songs that highlighted Valli's (alternate Frankie Valli Matt Corner's) incredible vocals, such as My Eyes Adored You and Can't Take My Eyes Off You were truly amazing. But for me, I think the most entertaining song of the show was December 1963 (oh what a night), sung by Bob Gaudio (Sam Ferriday). The song itself will have you tapping your toes in seconds, the scene will make you smile and the amazing Sam Ferriday gave a lovely vocal performance. Not to mention the fact that his charisma was off the chart, and his beaming smile lit up even the very back of the upper circle where I was sat! In fact, cast wise, the show was blessed with a group of hugely talented actors! Lewis Griffith was hilarious as Nick Massi, while Stephen Webb as Tommy DeVito stole every scene he was in! He had charm and was one hundred percent at home on the stage. The rest of the cast was hugely talented too, often playing a multitude of different characters, singing and dancing nonstop and delivering wildly energetic performances throughout! The musicians in the company also deserve praise, as their playing kept the audience on their feet long after the lights went up at the end of the show! Unfortunately though, although I enjoyed the show without a doubt, I do feel like something was missing. Although there were some amazing moments, as a whole the show didn't blow me away. Most songs were just snippets, or felt like them, and the story felt long winded. I liked the fact that you felt like a fly on the wall in the lives of the singers, and I absolutely loved the fact that the story was split into four sections (spring, summer, fall and winter) and each section was narrated by a different member of the band, but I never felt like I truly saw their rise to fame. There was no big 'wow' moment that signified the scope of the fame that The Four Seasons experienced. I just felt a little bit disconnected. That being said though, as a whole I thoroughly enjoyed my night seeing Jersey Boys, and I was humming 'Big Girls Don't Cry' all the way home. If you're a The Four Seasons fan, or a fan of 60s music in general, then this is definitely the show for you. If you're not I would still recommend it, but for me, while it was enjoyable and I'm glad I saw it, Jersey Boys didn't take me on the emotional journey I had expected it too.